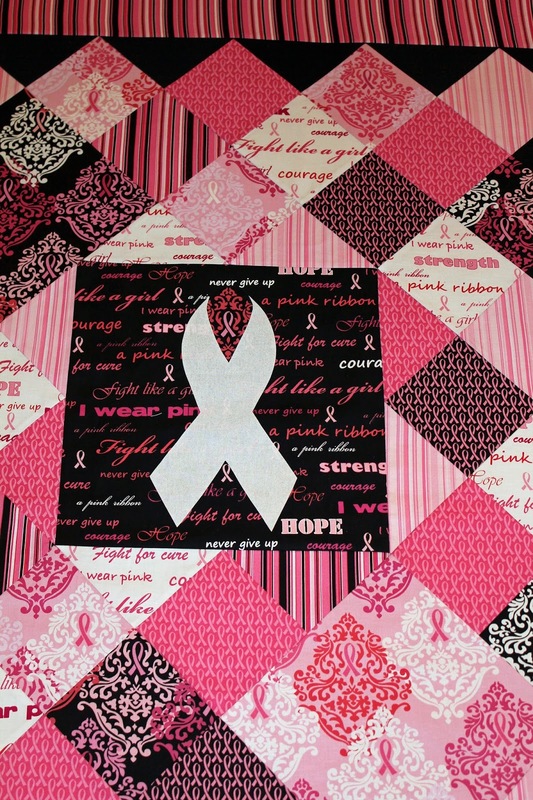 Here are pictures of the cancer quilt my BFF and I made for my MIL. 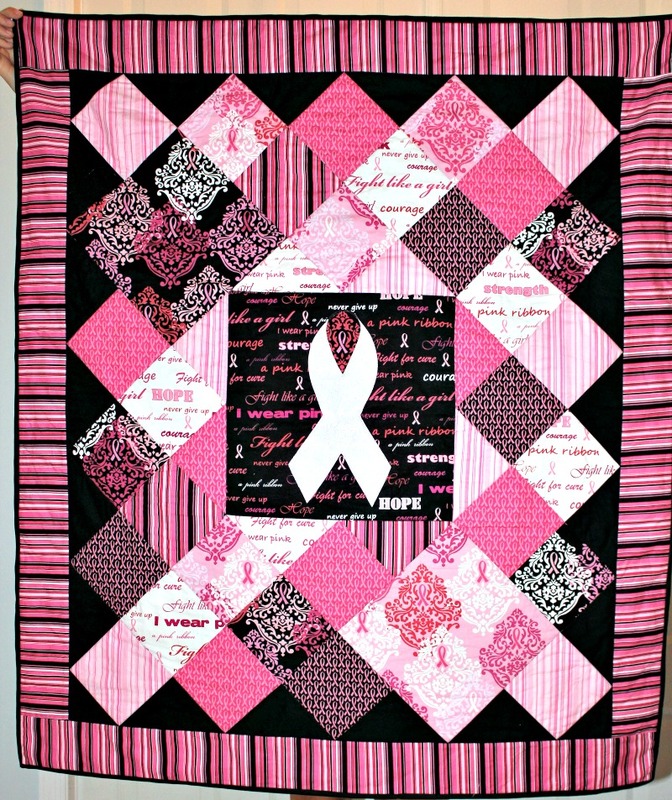 The fabrics are from a breast cancer kit but we changed the color of the ribbon to represent lung cancer. 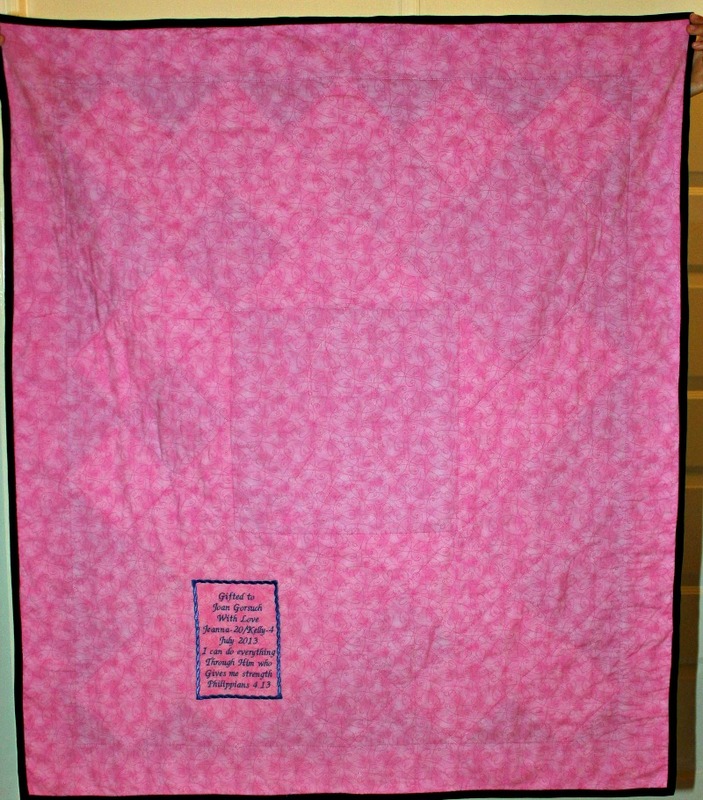 We found this fun heart swirly backing fabric at our local Joann’s store. We machine embroidered the label. 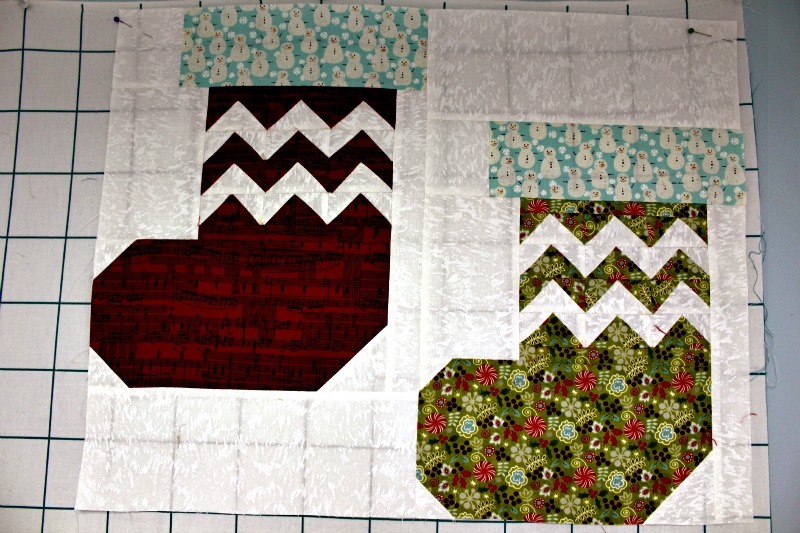 I also finished the Fat Quarter Shop’s Deck-Ade the Halls stockings block. This project is just a ton of fun. The servers have car related names. Jaguar usually waits on Mom but that day we had Dipstick. 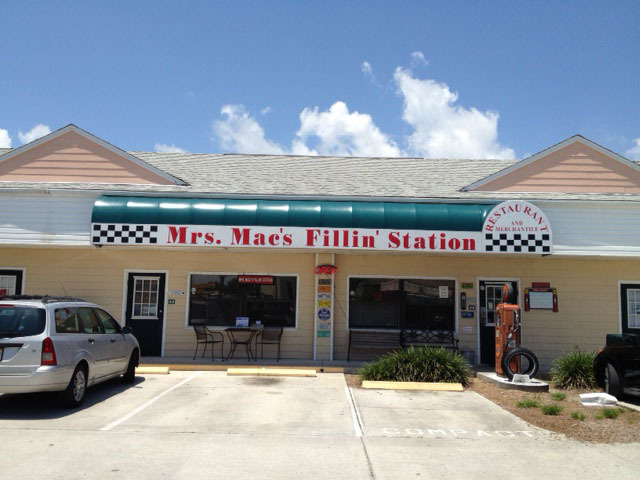 The flatware is wrapped in oil rags and when you squeeze a lemon and wipe your hands, the oil rag turns black… like oil. 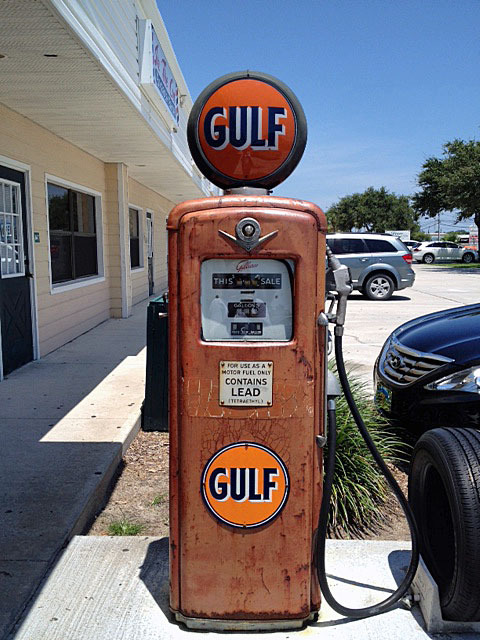 Inside of the place is so adorable with license plates and vintage garage signs everywhere. Of course, I didn’t have a camera (other than my phone). I promise to go back and take lots of pictures…you are going to LOVE this place. 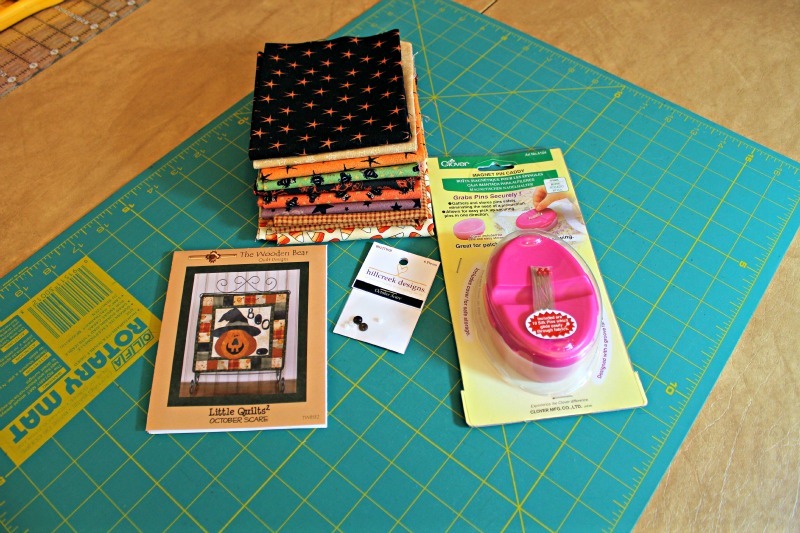 We stopped at a quilt shop where I purchased a little something to make a Halloween quilt for my small hanger and a magnetic pin holder. Then, wouldn’t you know, there was a yarn store right next door! 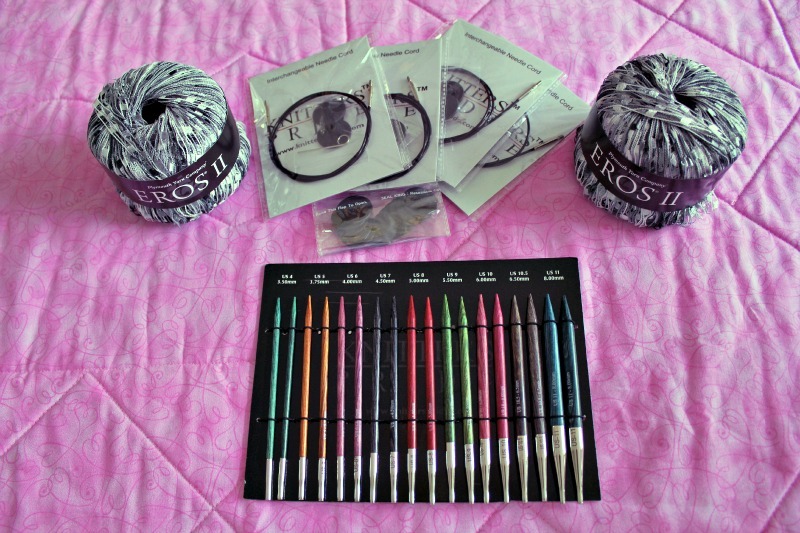 My sweet Mama bought me a set of my favorite knitting needles. 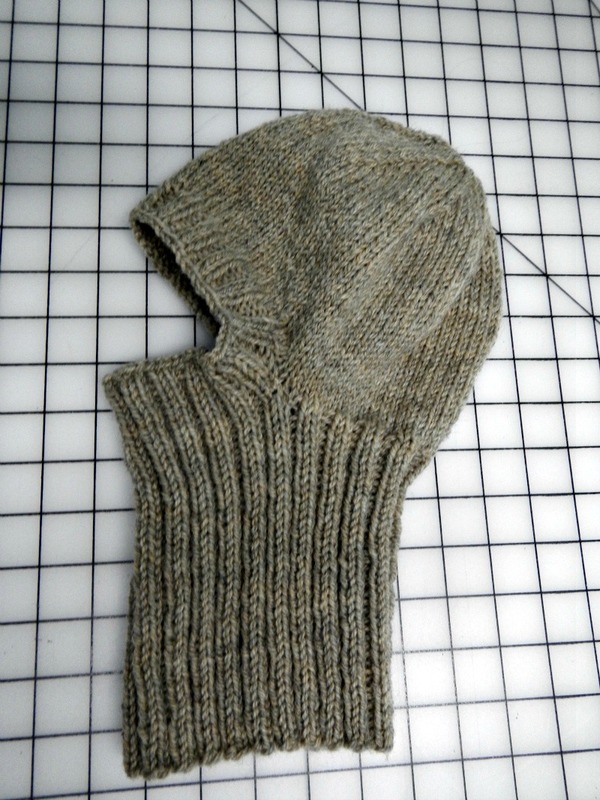 For some reason, I absolutely canNOT knit with straight needles. I do everything on circulars. The Knitter’s Pride Dreamz needles are great. You can attach them to different lengths of cable…whatever your project requires. She also purchased some yarn so that I can make her a scarf. 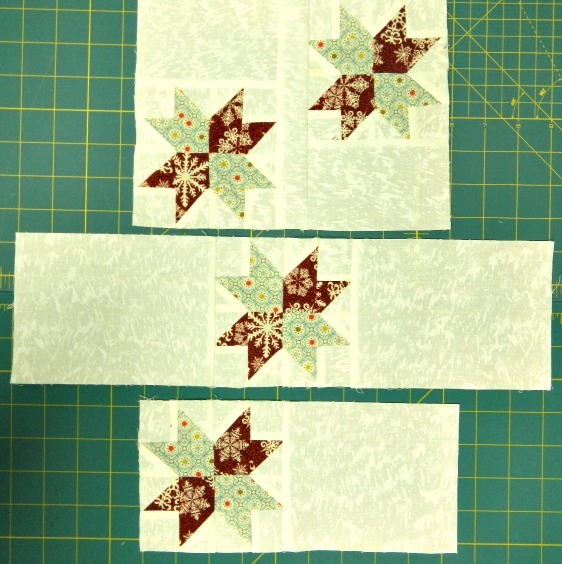 Today I worked on my next block pattern from the FQS, I’ll share those pictures next time. The Oliso quilter’s iron sounded impressive but my very dear blogging friend Candace has already owned TWO of them and prefers her Oliso household model much better. So…. I compared her ‘blue’ version to a few Rowentas. 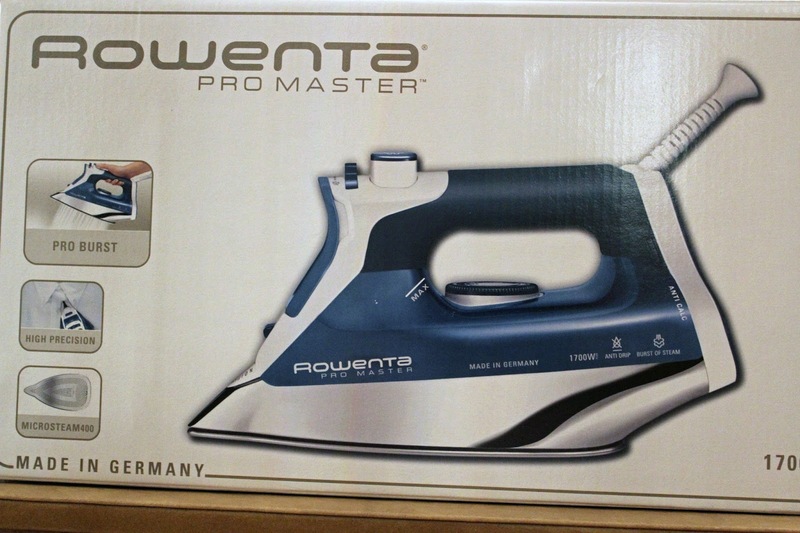 Bottom line is that I love all the features of the Oliso blue iron but was able to find those in a less expensive and heavier Rowenta. It’s just out of the box…haven’t even plugged it in yet. Of course, I will follow up with feedback because I will either love it or not. A very close and dear family member has been diagnosed with Stage 3 Lung Cancer. I’ll share more about her later. Pearl is the ribbon color for lung cancer. 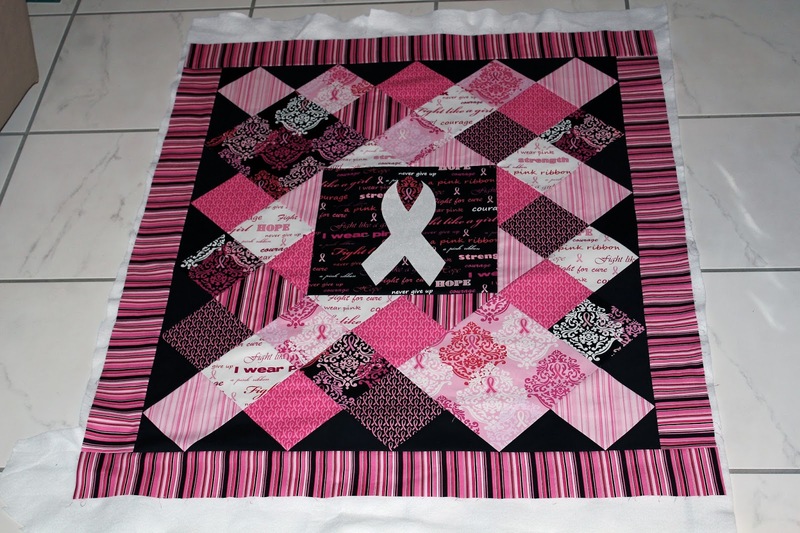 I have to finish the quilting, binding, add the label, launder and it will be shipped off on Thursday. I’ll have pictures of the finish this weekend as well as the Fat Quarter Shop’s Deck-Ade the Halls block. Happy Sunday after the 4th of July! I hope you have had a wonderful weekend, including those celebrating the American 4th of July. 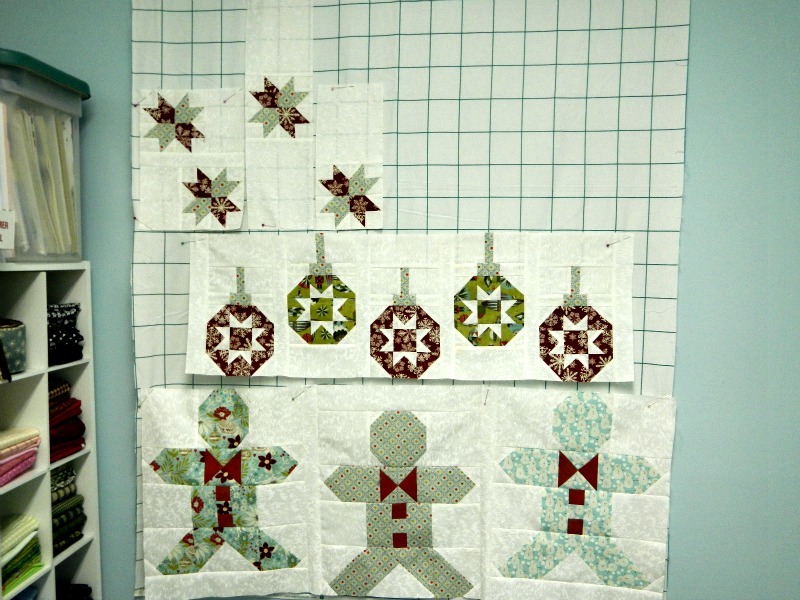 I caught up on the Fat Quarter Shop’s Deck-Ade the Halls quilt. Can’t wait for tomorrow’s new pattern! 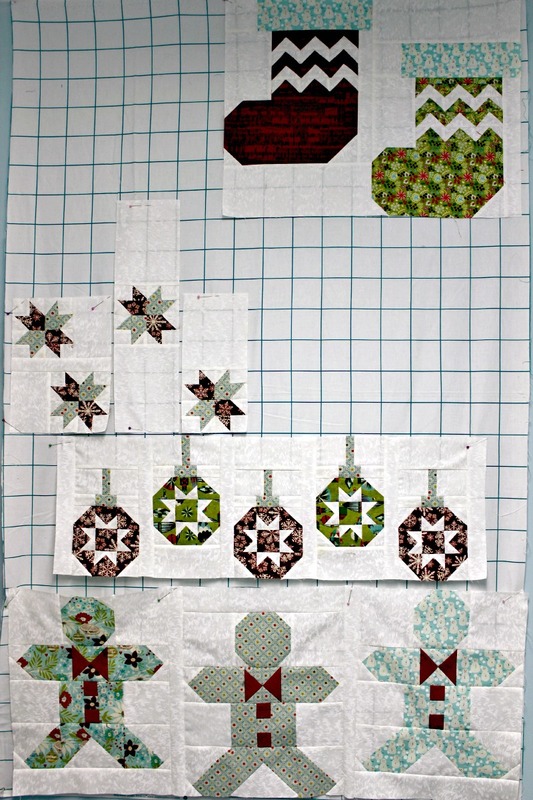 I also finished my blocks for Aunt Reen’s June Sew-A-Long… still behind but making progress none-the-less. 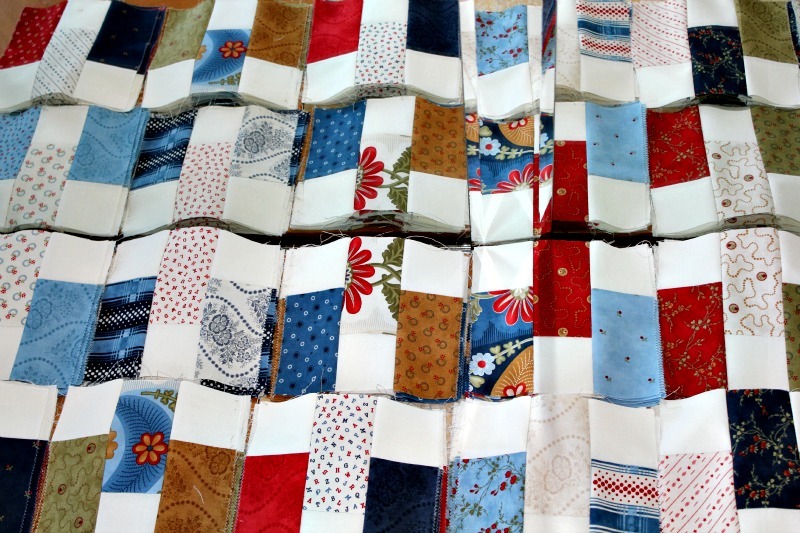 There are some blocks that I really love and some that …well, not so much but they are still going into this quilt! All of this progress in spite of a big UH OH! 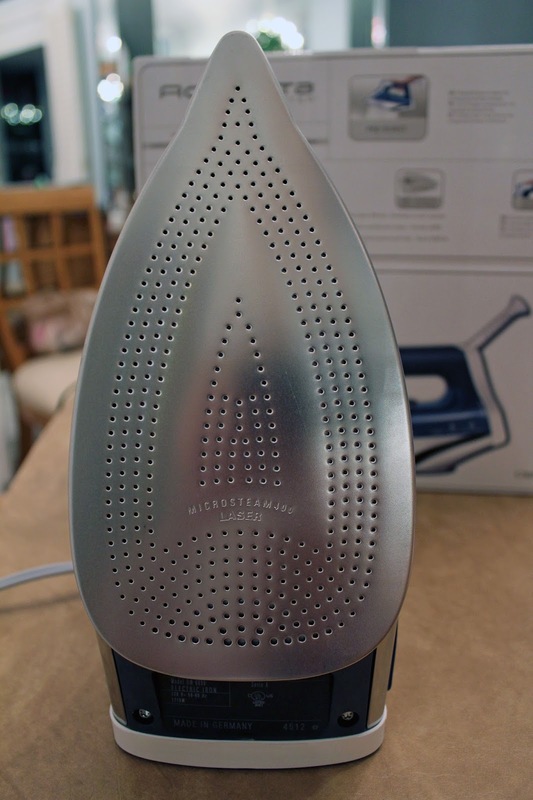 Now that I am in the market for a new iron, I am looking for recommendations. 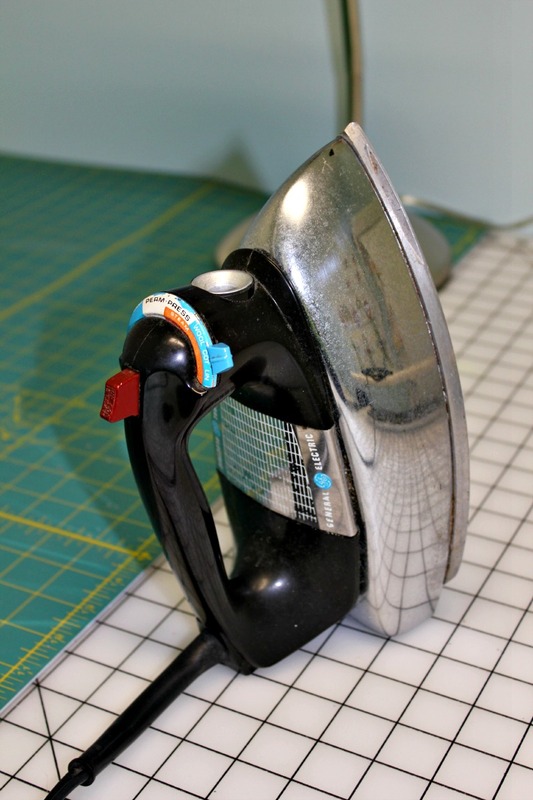 I don’t like a ‘wimpy’ iron, I need something that will do the job on quilting projects as well as household ironing. 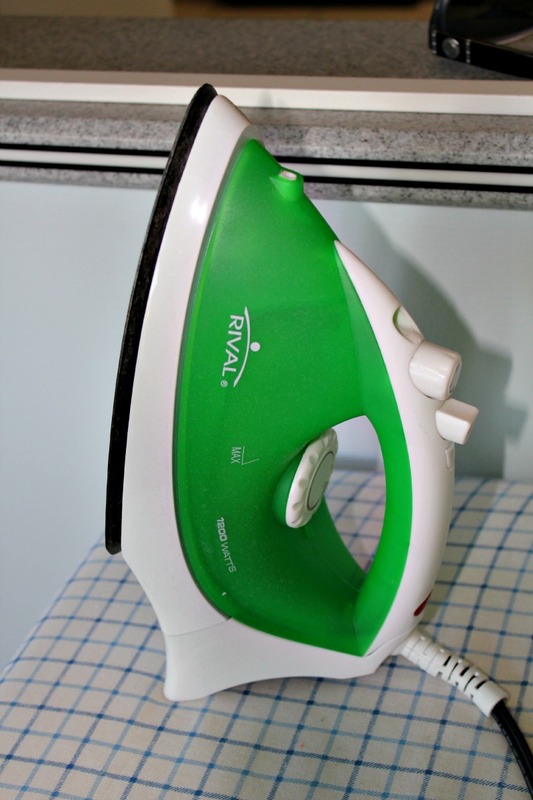 I’ve owned a Rowenta (loved that iron) and I’ve heard a little bit about Oliso’s. Do you have a suggestion or recommendation? 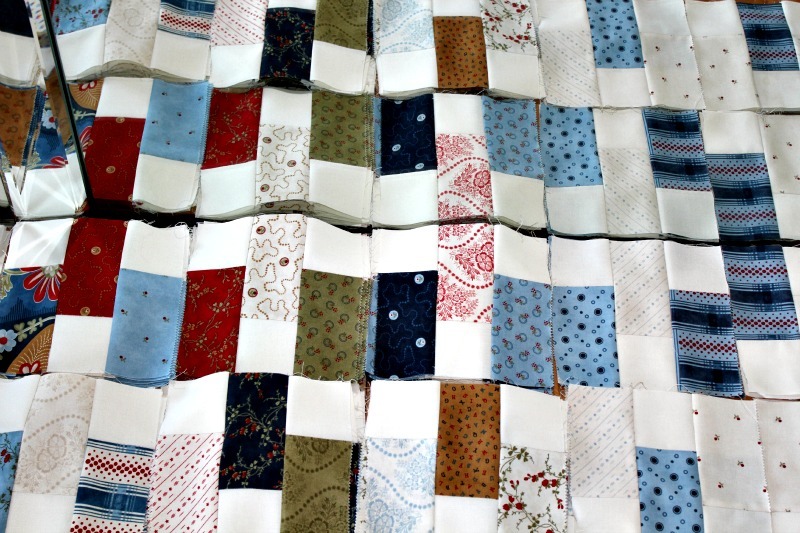 Also, do you use steam or a dry iron when pressing blocks for a quilt? Hope your screen door is slammin' this week my Friends! To everyone on my side of the pond…I wish you a very Happy and Safe 4th!